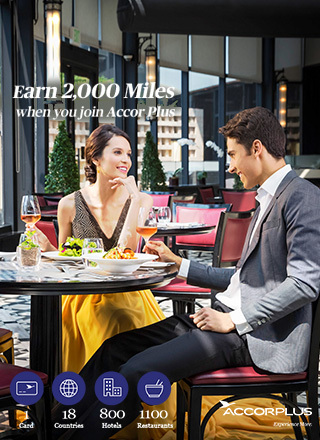 Accor Plus, Asia Pacific’s most expansive travel, dining, and lifestyle program, is offering 2,000 Miles to new primary members. Mabuhay Miles members can also enjoy incredible benefits from Fairmont, Sofitel, Swissotel, Pullman, MGallery, Quay West, The Sebel, Grand Mercure, Novotel, Mercure, and Ibis. In order to earn 2,000 Miles, Mabuhay Miles members must fill out the inquiry form to purchase Accor Plus membership from this landing page only. Please fill your information in the form under "Join Now" button and an - Accor Plus Sales Consultant will contact the member. This promotion applies to new primary members only. This promotion is not applicable to both current and former Accor Plus members. This promotion may not be used in conjunction with any other promotion offered by Mabuhay Miles or Accor Plus. The Accor Plus membership card is an annual membership and will be processed and activated within two business days from the online membership enrolment and purchase. The Accor Plus membership card and welcome pack will be sent out to the address nominated by the member within 12 to 15 working days after activation. Shipments outside of the Philippines will be sent via registered mail and lead time for delivery cannot be guaranteed. The above Promotional Terms & Conditions are specific to this promotion and they do not constitute the full Terms and Conditions of the Accor Plus membership program. Before joining the Accor Plus membership program, you are required to read and agree to the Accor Plus Program Terms and Conditions in full. In the event of any conflict between these Promotional Terms and Conditions and the Accor Plus Membership Program Full Terms and Conditions, the latter will prevail. Mabuhay Miles Terms and Conditions apply.